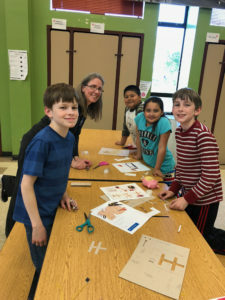 Way back in February, 2018, César Chávez PTA became aware of a National PTA STEM + Families Tech Night grant (sponsored by Microsoft) which consisted of $1,000 and supplies to host a STEM (Science, Technology, Engineering, and Math) night at our school. Mrs. Reynolds (4th grade neighborhood teacher), myself (Leah Hinson, Chávez PTA secretary) in coordination with Mr. Fuller (principal) applied for the grant. Our PTA was notified in March that we were selected for the grant! Our PTA was one of 35 PTA’s to be awarded the grant and we were chosen from more than 280 applicants! We were very excited to get started on planning the STEM night. Our amazing PTA co-presidents, Fred Smith and Keiona R Connor, coordinated with National PTA to make this event happen! 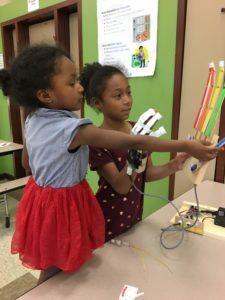 The goal of the STEM night was to engage both students and their families to work together on a STEM based project. The materials were sent from National PTA with additional educational materials to train our volunteers on the project. The project consisted on building a sensor which would control a robotic finger. Two days prior to our STEM night, several volunteers got together to figure out how to build the sensor. Keiona, Fred, Mr. Hernandez, Mrs. Reynolds, Mr. Hedine and myself, worked together to figure out how the project worked. We had great fun working together to build the sensor. Mr. Hedine and Mr. Hernandez made videos of themselves controlling the robotic finger! The night of the event on May 11th, we had many volunteers there to support the event. 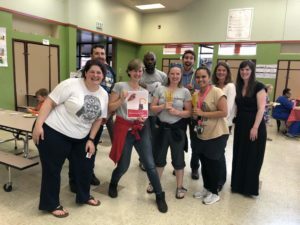 We had Amber Clark and Ms. Janelle helping sign guests in, Skye Waggoner worked the raffle prize table, Toby Query helped get participants their materials, and many teachers and other PTA members and community members supported families as they worked on their sensors. After completing the sensor and testing it out with the robotic finger, families were directed to the cafeteria for dinner. Sam Lett, Carmen Flores, Hilda Hernandez and Alice White-Cyr served guests food. A lasagna and salad dinner was served, with cookies for dessert. All children who attended chose a door prize (a balloon powered helicopter toy, a rubix cube or another puzzle), and there were 7 larger raffle prizes! 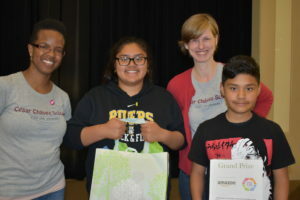 The grand prize was a STEM subscription set from Amazon. A STEM based gift (toy, game or book) will be sent home 4 times over the next year to winner Angel Hernandez! We had around 95 participants and over 15 volunteers at the event. Some of the volunteers were even able to participate and build the sensor with their kids while also helping out at the event. Everyone seemed to have a lot of fun. There was a lot of socializing and good feelings that night at the school. Thank you to all who participated, who volunteered, who helped plan the event and thank you to National PTA and Microsoft for providing this awesome opportunity for our school. 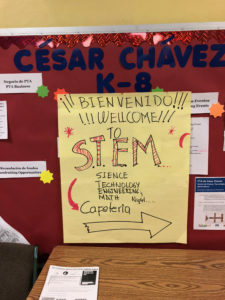 I look forward to future STEM events in years to come at César Chávez school!